isearchnow.com is an untrustworthy search tool that arrives on computers next to freeware and shareware. After it steps onto your computer, it then changes browsers’ settings. It changes homepages and default search tools on all users’ web browsers. Because of this, they discover a new page when they open any of their web browsers. If you have become one of the users of isearchnow.com against your will too, go to remove isearchnow.com as quickly as possible because such untrustworthy search tools often cause problems by displaying commercial advertisements to users. Actually, ads are only one out of several drawbacks this website has. It cannot be called a trustworthy search tool despite the fact that it looks legitimate also because it actively gathers information about users. The following paragraphs of this article are going to tell you more about this search tool. Also, you will find there everything you need to know about the isearchnow.com removal. One of the biggest and most noticeable drawbacks of isearchnow.com is sponsored links. People who use isearchnow.com as a search tool find them on its search results page and, unfortunately, click on them without fear because they do not know that they might be harmful. We do not blame them – these sponsored links barely differ from normal search results based on the entered search query. The worst these ads can do to you is taking you to untrustworthy pages with malicious software. This is one of the reasons you need to uninstall isearchnow.com from browsers as soon as possible. Sadly, there are more reasons why the isearchnow.com removal should be implemented soon. It has been observed that this website might track users and record information about them in the background. This might not sound dangerous at all, but, believe us, this might bring you problems associated with your privacy. Where does isearchnow.com come from? 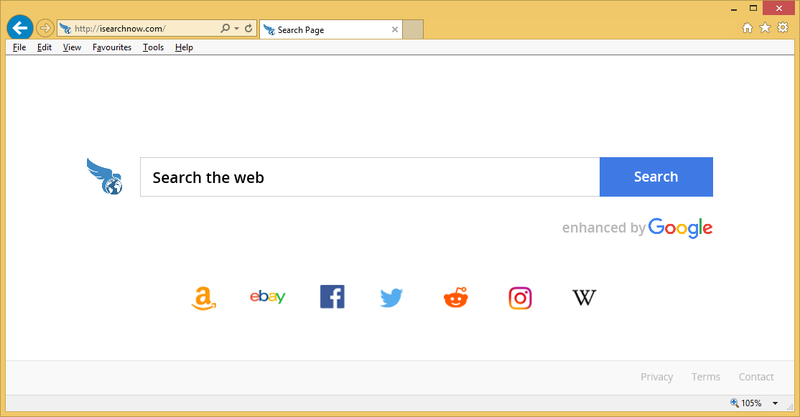 If you have discovered your browsers’ settings changed, you must have a browser hijacker infection active on your computer. It could have entered your system bundled with freeware and shareware, but if you are sure that it has entered your system in a different way, remove isearchnow.com too without thinking twice about that. It is not so easy to protect browsers from changes browser hijackers and other untrustworthy programs apply when they enter computers because they might be spread using a variety of different methods, they can enter PCs unnoticed, and they do not ask permission before making modifications. Luckily, this does not mean that you cannot protect your system – install a security application on your computer. How do I delete isearchnow.com? isearchnow.com can be erased from browsers either manually or automatically. We recommend choosing the automatic method over the manual one because, in this case, you will only need to launch your scanner to delete isearchnow.com from all your web browsers. If you still decide to erase an undesirable web page from your browsers manually, you should first try resetting your web browsers to default. If this does not work, check Control Panel and erase all suspicious applications. In case this does not work either, let an automatic malware remover delete isearchnow.com for you automatically.